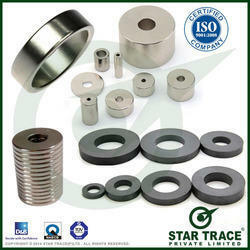 Star Trace leading Manufacturer, Supplier and Exporter of Ring magnets from Chennai, our product range includes Magnets such as Alnico Magnets, Rare Earth Magnets ( Neodymium ) and Ferrite Magnet. 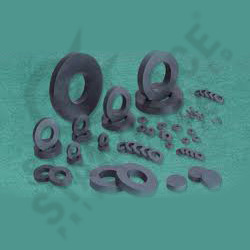 Ferrite Ring Magnet are Composed of Strontium carbonate and iron oxide. They are charcoal gray in color and usually appear in the forms of discs, rings, blocks, cylinders, and sometimes arcs for motors. o.d x i.d x h: Cat. No. Do ask for other details and prices via email , sms or phone. Clients can avail from us Ferrite High Power Magnets. These magnets are available in many shapes like circular, rectangular and disc. Our packaging experts make use high quality material in order to determine their non-chipped state in transit. Furthermore, our auditors ensure that these adhere to global standards of quality. Our company has been successful in winning appreciation from the clients as one of the most prominent names in the trading of Ring Magnet. an annular magnet with face poles.